Food has been central to Seattle food writer Hsiao-Ching Chou’s life almost since the day she was born, and it’s not just because her parents ran a Chinese restaurant while she was growing up in Columbia, Mo. Gathering around a table with family to savor a simple stir-fry or plate of chicken-stuffed wontons ( which she first learned to fold at age 8) was the glue that kept everybody together, she says, as well as a way to pass on important family traditions. “It’s just woven into our culture,” she says. As a newspaper food writer and editor and later a food blogger who’s been featured on national radio and TV shows, she introduced many of the comforting recipes she ate as a child to an audience hungry for authentic Chinese food, and sometimes a little scared to tread into foreign waters. Yet as she writes in her new cookbook, “Chinese Soul Food” (Sasquatch Books; $24.95) that hit store shelves last month, any kitchen can be a Chinese kitchen. Because at its heart, Chinese home cooking is all about being resourceful and adaptable. 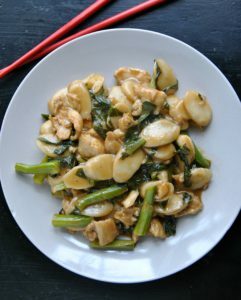 Many dishes, in fact, start not with a recipe but a quick survey of what ingredients one has on hand and what flavors one wants to emphasize.Chinese food can be daunting for many home chefs, Ms. Chou says, because so many ingredients and cooking methods are unfamiliar to American sensibilities. This can be especially frustrating on Chinese New Year, which is on Feb. 16, which you might want to celebrate with one of the “lucky” foods served during the 15-day festival. For beginners, that can prove vexing. Which is why when she set out to write her cookbook two years ago, she decided to walk her readers through each step of the process, from ingredients to equipment to techniques, in a super-friendly way. She takes the same approach in the cooking classes she offers at Hot Stove Society, an avocational school in Seattle. On Chinese New Year, the focus is on foods with auspicious qualities: extra-long noodles and rice cakes for longevity, whole fish for family unity, dumplings for wealth, softball-sized pork meatballs braised with heads of Chinese cabbage to symbolize power, strength and family reunion. Growing up, Ms. Chou’s New Year meal always was shared with her surrogate family — her parents’ restaurant staff, many of whom were students from China or Taiwan. The food was simple, but there was plenty of it. It was a delicious reminder of home. Now that she’s married with two children, her Seattle home is the gathering place for the celebration, with her mother, Ellen, presiding over the table. There’s a giant feast with a variety of dishes, and red envelopes filled with money for the many nieces, nephews and grandkids. Ms. Chou’s intention in writing “Chinese Soul Food,” she says, was to bridge the gap between what many Americans know as Chinese food and the traditional dishes you would actually enjoy in China. If you don’t own a wok, for example, that shouldn’t be a barrier to making a simple stir fry. A saute pan will work almost as well. At a time when cultural appropriation is part of a national discussion about food, you may wonder if it’s appropriate to celebrate Chinese New Year if you’re not Chinese. Ms. Chou says yes. “The more we can understand another culture, the more empathetic we can be,” she says. Gretchen McKay: gmckay@post-gazette.com, 412026301419 or on Twitter @gtmckay. You can find Shaoxing wine, Chinese broccoli and rice cakes (in the refrigerated aisle) at Asian markets. In small bowl, combine chicken and 1 teaspoon soy sauce and mix well. Add cornstarch and mix well again. Preheat wok over high heat until wisps of smoke rise from surface. Add 1 tablespoon vegetable oil and heat for 5 seconds. Spread chicken in thin layer in wok. Sear slivers for about 30 seconds, then stir-fry chicken for about 1 minute until cooked through. Remove wok from heat, transfer chicken to a small bowl and set aside. Rinse the wok and dry with towel. Return wok to stove over high heat. Add remaining 1 tablespoon vegetable oil and heat for 5 seconds. Add broccoli and stir-fry for about 1 minute. Add water and rice cake, and stir to combine. Reduce heat to medium and let simmer for about 2 minutes, or until rice cake becomes reconstituted and has softened. Add hoisin, remaining 1 tablespoon soy sauce, and the wine, and stir-fry to combine. If it looks soupy, increase heat to high to reduce sauce, but keep stir-frying so that rice cake doesn’t stick to the bottom of wok. Add pepper and sesame oil, and give it one last stir before removing the wok from heat. I'm not a professional cook, but I love exploring Pittsburgh's many culinary treasures and testing recipes from the countless cookbooks that cross my desk as a food writer for the Pittsburgh Post-Gazette. After years of raising children (count 'em - five!) I also have developed a passion for getting the heck out of Dodge whenever I get a chance. I've included some of those stories here. You also can find links to “Cooking with Gretchen”, a series of award-winning cooking videos Post-Gazette photographer/videographer Steve Mellon and I have created in the “PG Test Kitchen” (my kitchen at home, if you want to know the truth). It's a tough job, but someone's gotta do it! Enjoy!